We started with yellow paper and drew a very simple tree, no pencils, no markers, just crayons. I had the kiddo's cut out the tree, which is a task, because they often want to cut the stump off too. 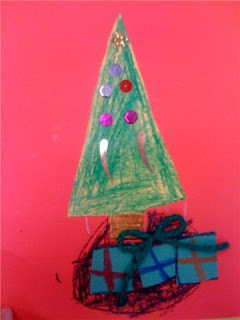 Then we glued onto red paper, and added sequins for ornaments. They freak out over this, they love anything that shines! Then, they were to add the 'tree skirt'. We added some packages under the tree, and the results are pretty good for this age group.